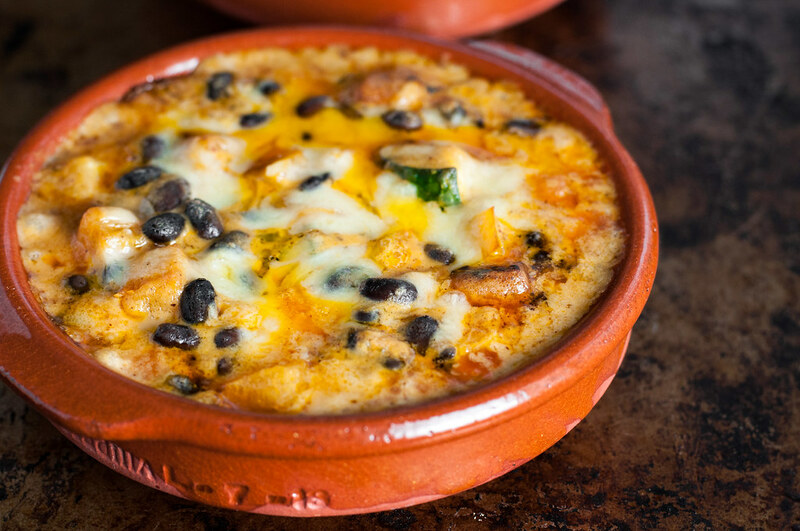 Some people like to eat their queso as an appetizer, on chips or tortillas. I prefer mine for dinner, flecked with vegetables and beans so it becomes acceptable to categorize it as casserole. I’ll be frank with you: as the photos suggest, this is one cheesy dish. You definitely could get away with serving it as a dip or appetizer, if the veggies are cut into small enough pieces. 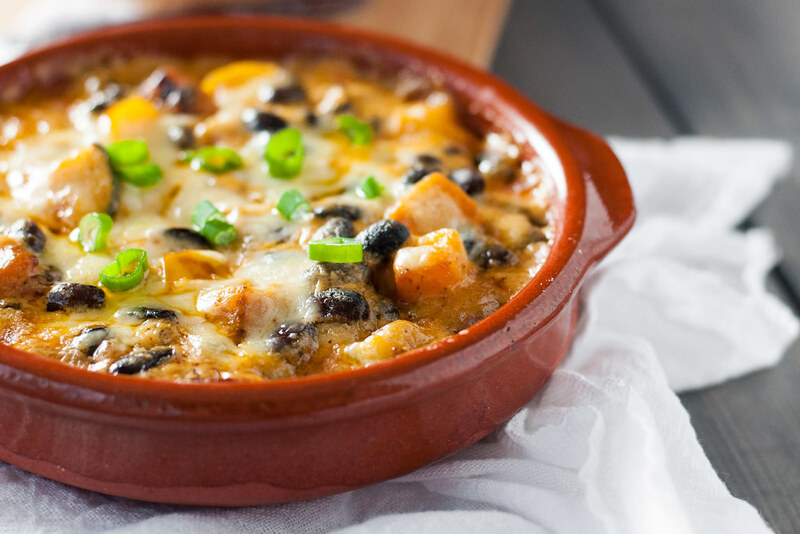 If you anticipate the balance of cheese and veggies to be too, well, out of balance, for your taste, throw in an extra cup or so of beans or veggies, omit the cream cheese, or set aside some cheese sauce for another use (nachos?). I’ll just be over here taking my version extra cheesy and loving every bite of it. 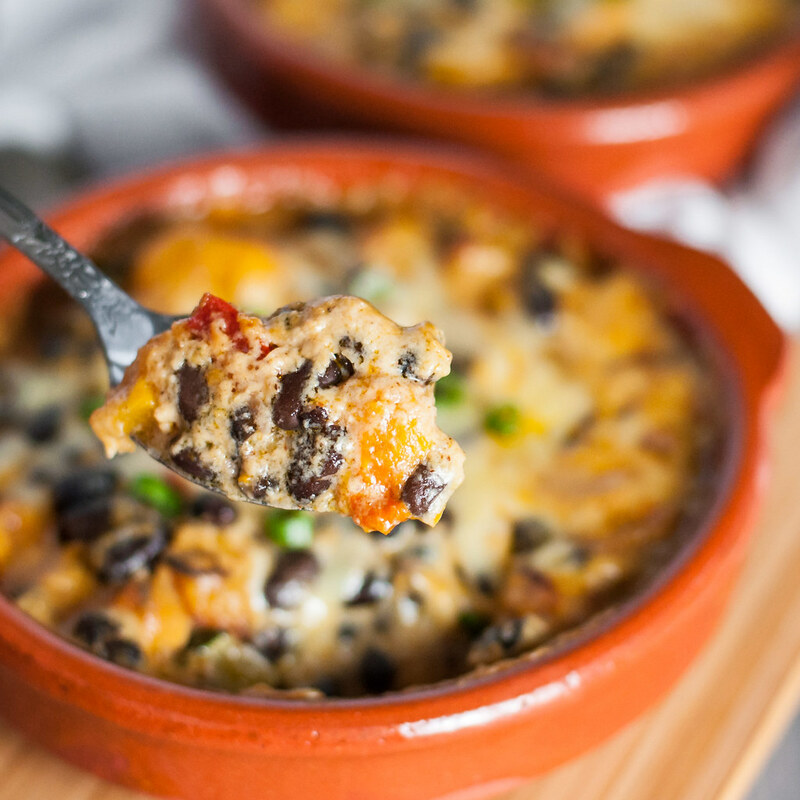 Setting out to create a spicy chile cheese sauce this summer, when the triple-B (Black Bean Butternut) hot dish first took shape, I was over the moon when this sauce came out tasting like a nacho cheese Dorito on the first try. Attempting not to drip cheese sauce all over the floor, I sprinted over to Steve on the couch bearing a spoonful for his evaluation, and he agreed. Could he please have a bowl of it? No, but I did find an excuse to eat it for dinner, which came in the form of mixing it with a huge, colorful variety of crunchy, bite-sized veggie pieces, sauteed to browned perfection to lock in moisture and keep the finished product from coming out too watery. Then, to up the Mexican factor, in went loads of cooked black beans, making for a complete, filling, meatless, one dish dinner. I wouldn’t give you a recipe involving three pans unless it was worth every minute spent doing dishes. If you have a little downtime on your hands, please share some with me. 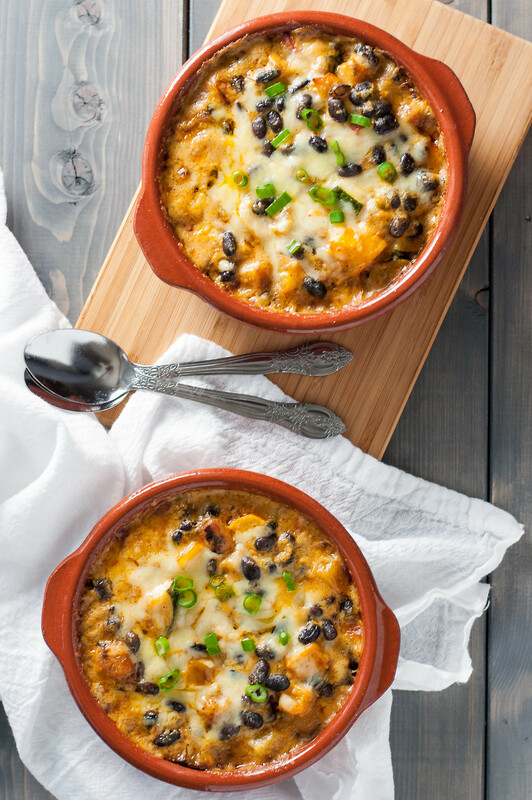 Then use the rest to make this whole nacho cheesy hot dish in advance and refrigerate or freeze it until you’re ready to bake it for dinner. Skip to the recipe now! 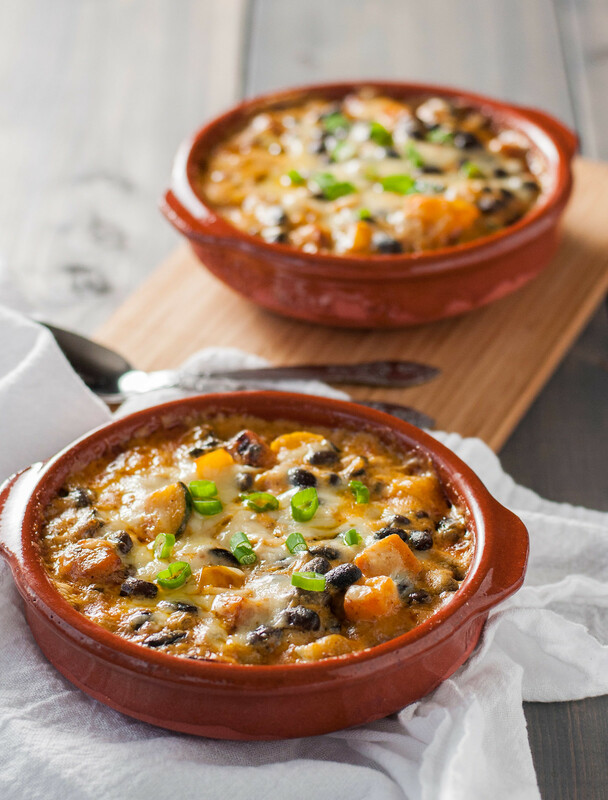 I did just that when I finalized the recipe last week, and, to make up for my absence when I leave on Friday for my sister’s bridal shower in Oklahoma City, Steve gets to eat his way through individual frozen portions of black bean butternut hot dish. I meant to post the recipe last Friday, but I was neck deep in duck fat and homemade stuffing. Yep, those Instagram peeks of our early Thanksgiving materialized on Saturday night into one of the most seamless dinner gatherings I’ve ever hosted. Taking a cue from Ina’s approach in her book, Foolproof, I scheduled out every detail of the cooking (well, mostly heating, since much of it was made in advance), and it allowed me more time than usual to sit down and enjoy time with friends, family, and a baby, knowing I didn’t have to be back in the kitchen for precisely 23 minutes to preheat the oven. Just enough time to take a load off and sip some champagne. I think I need a new category of recipes for “almost-gluten free”. Pinterest and Instagram are in love with that #glutenfree hashtag for sure. Honestly, if you’re in need of some likes for a photo of your pet turtle, just tag it #glutenfree and I can guarantee you at least 12 likes. And hey, turtles are gluten free, right? As much as I advocate eating whole, unprocessed foods, three tablespoons of flour in cheese sauce once every two weeks is unlikely to cause crazy weight gain or health issues (of course, if you do have diagnosed celiacs disease, this exception does not apply). Hashtagging my recipes that fall neatly into a specific special diet category is a helpful way to quickly signal the benefits of that diet, especially when said diet is “trendy”, but it doesn’t say anything about the overall nutrition of the dish. Conversely, if the hashtag is missing, someone who isn’t at all sensitive to gluten but tries to limit their intake of processed grains (example A: me), may miss out on just the recipe they’re seeking! So what’s my point? During high comfort food season, prioritize big-picture balance. Do what’s right for your body, and choose foods that make you feel good–both healthy and happy, not miserable with deprivation or guilt. Sometimes a vegan kale salad or green smoothie boosts my mood immensely, but when I’m surrounded by friends and family or bombarded with a freezing-cold day, something warm and comforting, and maybe not perfectly healthy, has the same effect. Many recipes and tutorials instruct whisking a roux as the flour cooks and during and after the addition of milk, but I argue that a whisk is almost unnecessary. Let me explain, so you’re not confused by the complicated descriptions I use in every cheese sauce or white sauce recipe on this site. After sprinkling flour into the melted butter or hot oil, I use a wooden spatula to stir. The mixture is too shallow for a whisk to be effective (unless you’re making a very large batch) and, as long as you stir constantly while the flour cooks, you will not get a lumpy roux. The spatula is also more effective at keeping flour from caking in more-square-than-round corners of the pan, places where your average balloon whisk geometrically cannot reach. Flat whisks are much more suitable for this task, but I’ve never found the necessity so great as to purchase one. It seems to me it would be a one-use tool, and I’d rather spend money on quirky wooden spoons with a million other uses. Next step: incorporate the milk or broth. This is the step where I use a whisk, because brisk whisking will keep the contents agitated, ensuring that the roux is dispersed as evenly as possible throughout the liquid. However, after the liquid is in and I increase heat to simmer the mixture, I return to the wooden spatula. Again, it fishes almost any clumps of roux out of the corners or off the bottom of your pot. I do keep the whisk handy at this point, though. If my wooden spatula is picking up lots of clumps, I use the whisk to scrape clumps off of the spatula and to incorporate them back into the sauce, but then I put it down and return to the wooden utensil. If you have a foolproof method for sauces involving a roux, there’s no reason to abandon it, but if you ever have trouble or just haven’t quite nailed the process, give the whisk + wooden utensil method a shot for a clump-free, optimally thick sauce. Lay diced zucchini on a couple layers of paper towels, sprinkle with salt, and cover with more paper towels. In a large, nonstick skillet, heat a tablespoon of vegetable oil over medium high. 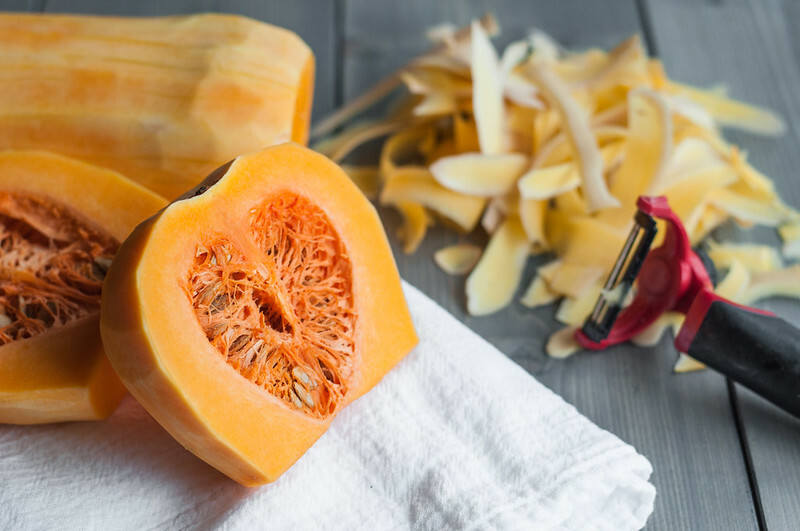 Add half the squash in a single layer and sprinkle with ¼ teaspoon salt. After 5 minutes undisturbed, stir occasionally for another 5 minutes, until browned and tender. Set aside in a large, heatproof bowl. Repeat with more oil and remaining squash. Press down firmly on towel-covered zucchini to finish absorbing excess liquid before cooking. Return skillet to medium high heat. Once hot, add 2 teaspoons oil and heat until shimmering. Add bell pepper and half the minced jalapeno, and cook until starting to brown, 2 to 3 minutes. 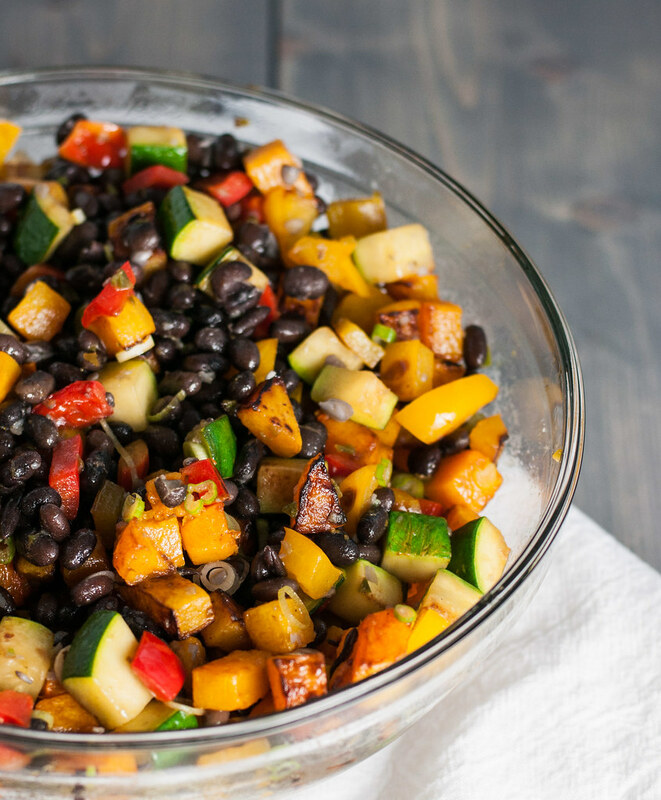 Add zucchini and cook in close to a single layer, stirring infrequently, until zucchini starts to brown. Remove to the bowl with squash, also adding the beans and half the sliced scallions. Stir to combine. Preheat oven to 375. Scald milk in a small saucepan, heating over medium until bubbles form around the edges, then turn off heat and cover to keep warm. In a medium saucepan, melt 2 ½ tablespoons butter over medium heat. Add minced scallions and the remaining minced jalapeno and cook a few minutes, until softened. If foaming vigorously, reduce heat slightly before continuing. Add flour and chili powder and stir with a wooden utensil for 3 minutes, until cooked and paste-like. With heat on low, whisk warm milk into roux slowly. Increase heat to medium high and switch back to a wooden spoon, stirring constantly to keep flour from settling in corners and bottom of pan. Once simmering, reduce heat to the lowest possible simmer. Still stirring constantly, cook 10 minutes, until sauce has thickened. Turn off the heat and whisk in cream cheese until incorporated, then 3 cups shredded cheese, half at a time, until melted. Season to taste with salt, starting with 1 teaspoon. (At this point, try not to eat all the sauce for the sake of taste testing.) Pour sauce over vegetable mixture and stir to coat. Scoop into 6 buttered ramekins (or medium casserole dish) and sprinkle with the last cup of cheese. Bake 20 minutes, until bubbling. Cool slightly and garnish with remaining scallion slices. Because the roux includes chili powder, its color will not indicate when it’s cooked. Make sure to cook at least 3 minutes to avoid a raw flour taste. I’ve made the sauce without cream cheese, and it’s still tasty. However, it lacks the really creamy texture you get when using it. For a main dish, it's fun to bake in individual dishes or ramekins. For a side, bake in a medium (around 2 qt.) casserole dish, so diners can choose their serving size. Freeze individual ramekins before baking and topping with cheese, if you know you won’t eat them right away. Cooking once always yields better results than cooking twice when it comes to freezing casseroles, as I’m learning. Is this to dip chips into ?